In stock -This product will ship today if ordered within the next 4 hours and 50 minutes. This lavender and geranium shampoo has been created with natural ingredients to care for you and the environment. Lavender and Geranium help to bring a sense of calm to every day, and this magnificently fragrant shampoo will do just that. Massage gently into wet hair, rinse well and repeat if required. 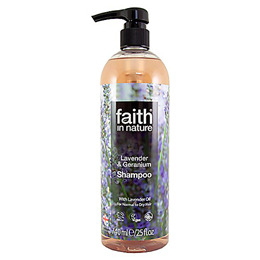 For best results, follow with Faith in Nature Lavender & Geranium Conditioner. For frequent use. Below are reviews of Faith in Nature Lavender & Geranium Shampoo - 740ml by bodykind customers. If you have tried this product we'd love to hear what you think so please leave a review.